Millennials’ expect engagement. 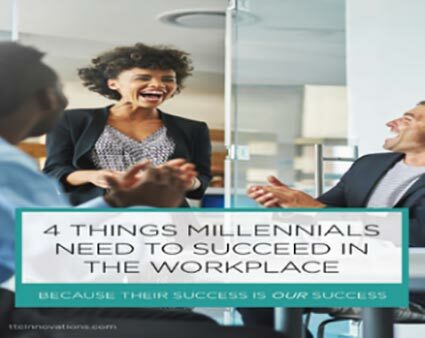 In fact, research tells us that Millennials indicate that a sense of belonging, or feeling like they have sense of purpose as it relates to their individual role in an organization, is a top factor. What are you and your company doing to ensure your Millennial employees are engaged? Can they link their role or job function to your organizations vision or mission? What could you do better or differently to address this need? While we all live and work in an increasingly digital world, perhaps one surprising need amongst Millennials workers is their desire for feedback. Sure, you can think in more traditional terms like annual reviews or formal coaching sessions. Those are important conversations to have, but think about how feedback can be incorporated into work being done on a weekly and even daily basis. When was the last time you provided feedback to a Millennial co-worker or employee? How could you re-think the way you work so that feedback is incorporated into the way your organization or team works? Millennials are the most educated workforce the world has ever seen. More Millennials have college degrees than any other generation before them. However, they came into the workforce during an extremely difficult time. Opportunities for advancement and growth have been hard to come by. They desperately want the chance to gain experience and grow into positions that offer challenge and responsibility. What opportunities for training and development do you offer to Millennial employees to prepare them for their roles of the future? In what ways, even informally, could offer opportunity to gain experience or take on more responsibility? Given the capabilities of the technology driven world we live in and the blurred lines between the traditional workday and workweek, Millennials expect the ability to have input on when, where and how they will work. This includes the type of work they do. In survey, Millennials indicate they are turned off by the thought of doing the same job day in and day out over and over again for the lifespan of their career. In what ways can you offer flexibility to your Millennial workers? Can you offer flexibility not just in when they work but also how and where? What might this look like in your organization or on your team? Nothing on this list should come as a surprise. Much of what you see here could be applied to any generation. By 2020 Millennials will represent the largest generation in the workforce though. Their success is our success.